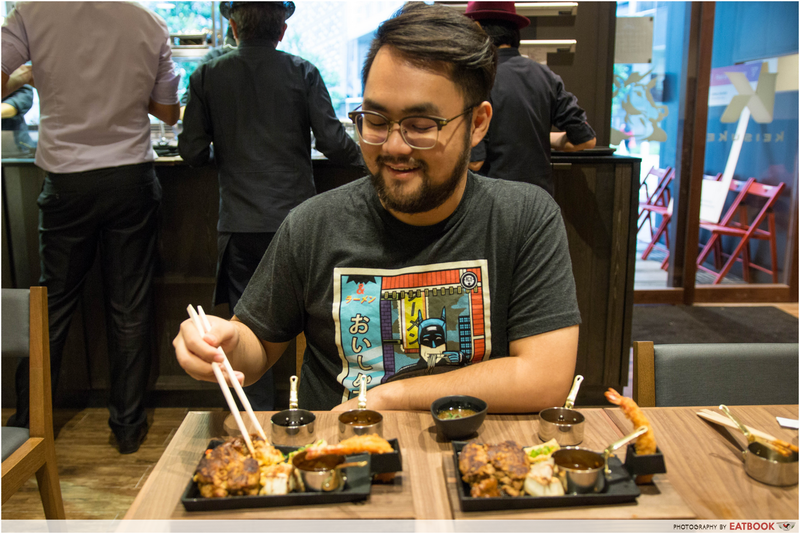 Since opening his first ramen store in 2010, Chef Keisuke Takada hasn’t stopped making Japanese staples mainstream in Singapore. 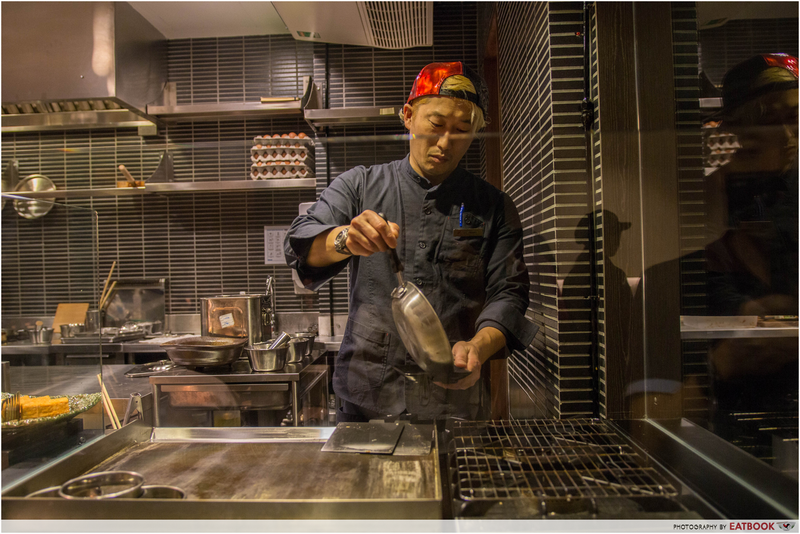 In the past seven years, he’s opened eight ramen shops, a gyoza joint, a Japanese tendon restaurant, and a sake bar – all named after himself. 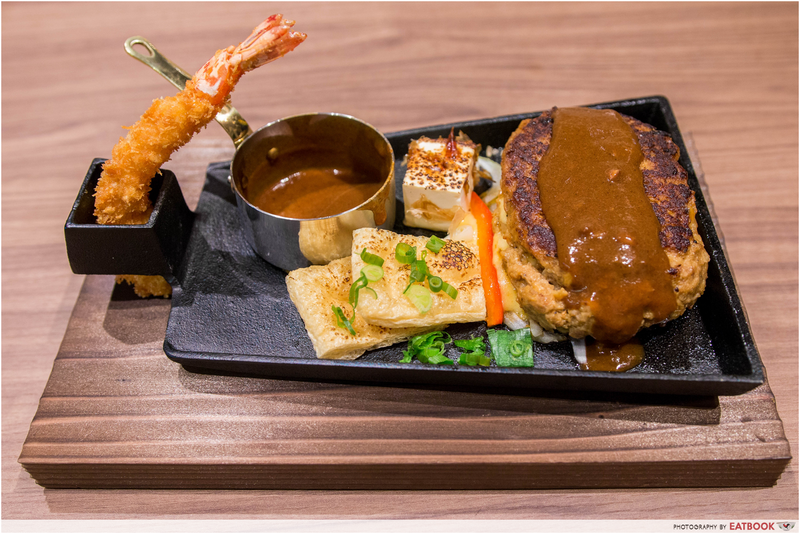 Now, Chef Keisuke is tackling Japanese hamburger steak with Teppanyaki Hamburg Nihonbashi Keisuke Bettei, or Hamburg Steak Keisuke. We usually think of hamburgers as either beef patties inside a bun, or people from the German city of Hamburg. 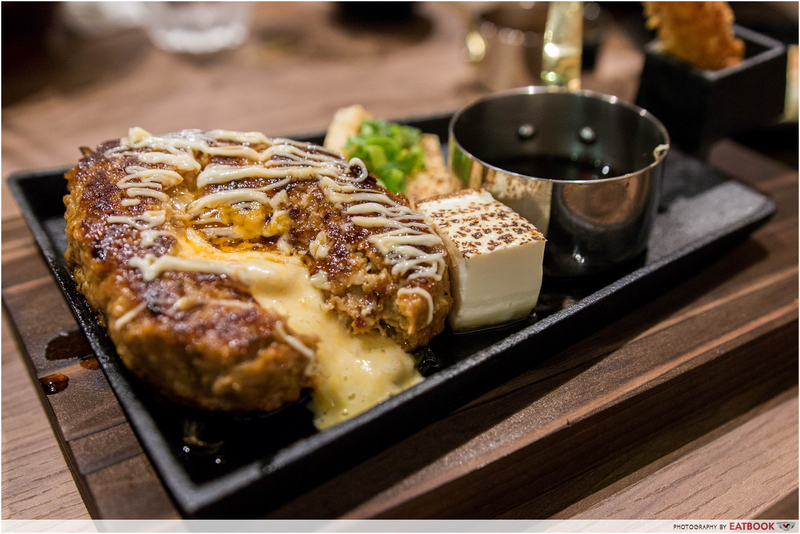 In Japan however, a hamburg is a significantly large minced beef patty – about 2-inches thick – containing onions and spices, and served with sauces and side dishes. 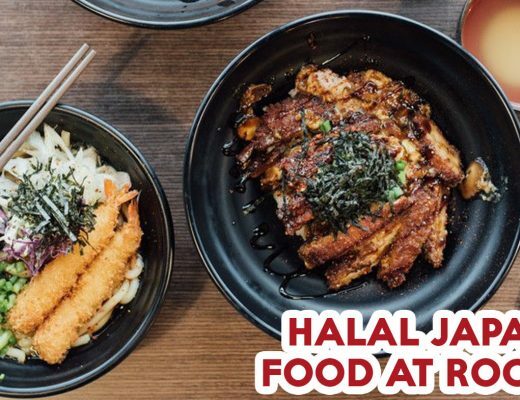 According to Chef Keisuke, the dish is immensely popular in Japan, and is the next step in his Japanese comfort food invasion. 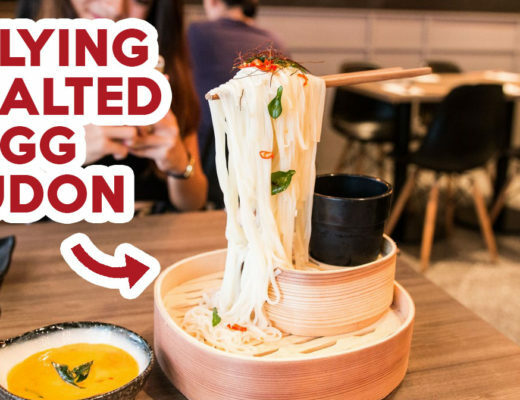 There are only two items on the menu, and they’re essentially the same thing. Keisuke Prime Beef Hamburg Set ($18.80++) is a 150g patty of prime beef shoulder cut that’s been minced in-house into two sizes, all in the name of better texture. 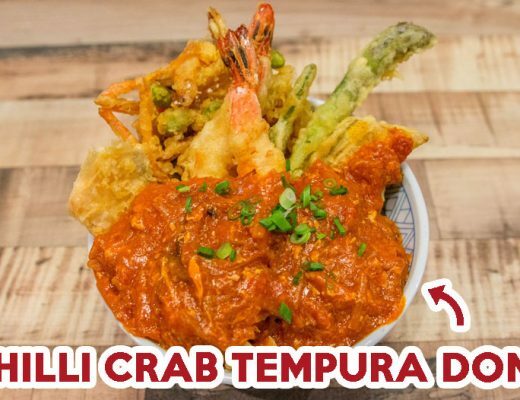 It comes with an ebi fry, a cube of tofu, and two pieces of aburaage, which can be best described as flattened taupok. I’ve never had beef like this. The meat was surprisingly tender, and has an almost tofu-like texture. This is the point where you start doubting my credibility, but I assure you the cooks here have somehow made a beef patty so delicate, it almost crumbled off my chopsticks. The patty had none of that characteristic beefy stench. Instead, all I tasted was clean, well-seasoned beef, along with the slow-cooked onions that’s been tossed into the mix. 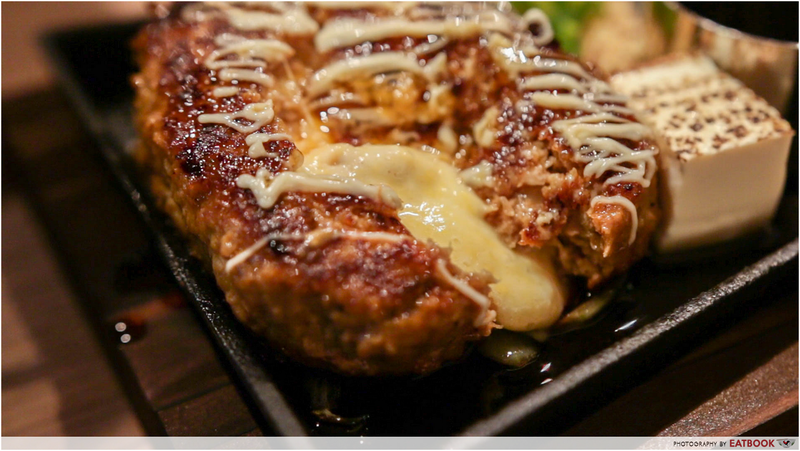 The other item is Triple Cheese Prime Beef Hamburg Set ($20.80++), which comes stuffed with – you guessed it – cheese. Made with the classic cheese trinity of cheddar, mozzarella, and parmesan, all you need to do is gently prod the patty and the golden-yellow combination almost immediately oozes out. Unfortunately, the cheese hardly tasted like cheese, and could afford to be sharper. 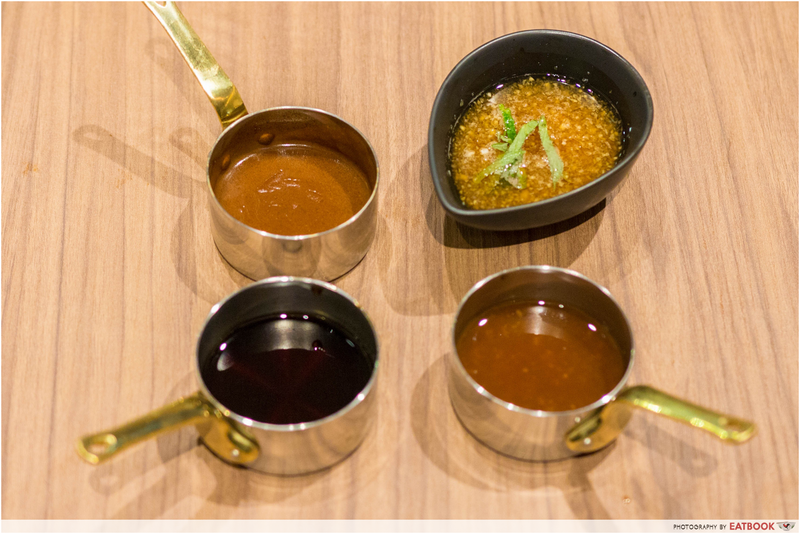 Each set comes with your choice of one out of four sauces: original, demi-glace, teriyaki, and oroshi ponzu (radish with vinegar). I usually like my beef sauceless, but the demi-glace and its tartness worked well with the meat. 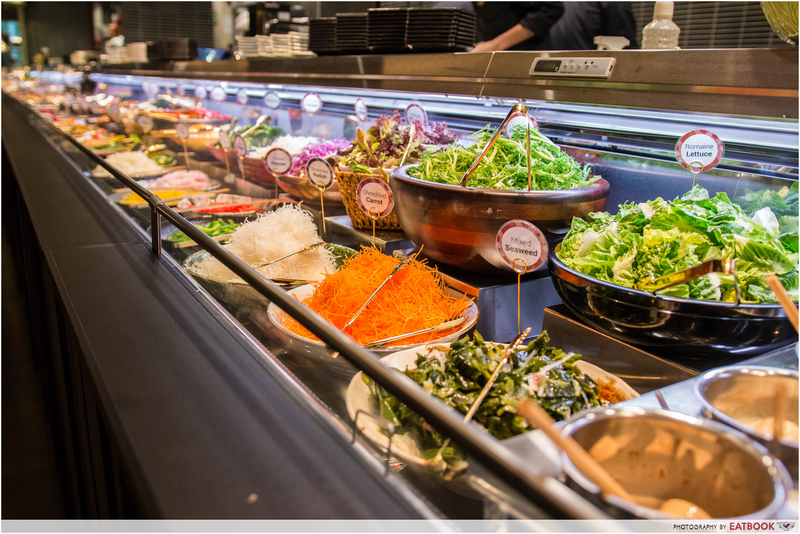 Every main ordered gives you unlimited access to their salad bar. 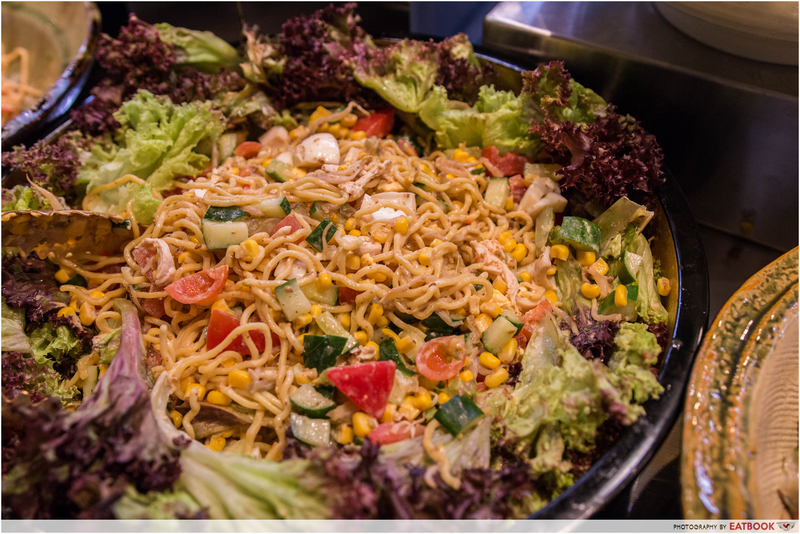 With over 20 types of greens and noodle salads, there’s a very good chance you’ll fill yourself up with just sides. But don’t you dare. You’ll just be wasting stomach space when you really should be digging your teeth into hamburg. If you have to get something, pick up some Sapporo Ramen Salad. Savoury and tart, it’s great as both a pick-me-up and palate cleanser. At any Keisuke restaurant, you’re bound to notice a container of hard-boiled eggs. 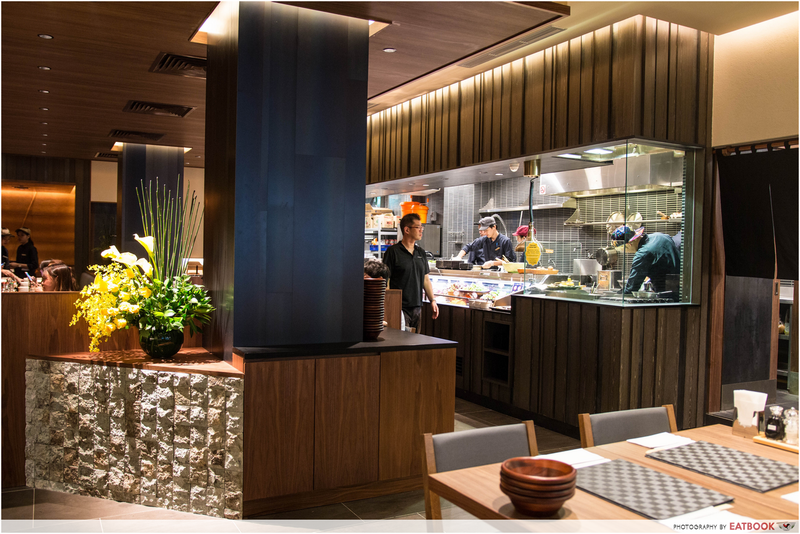 This is a reflection of Chef Keisuke’s mission to make diners happy, because he’s discovered Singaporeans’ fondness of eggs. Which is why the true star here is the egg station. Helmed by a chef, you can take your pick from six ways of egg preparation. Or, go ahead and try out all six, because the eggs are free-flow anyway. 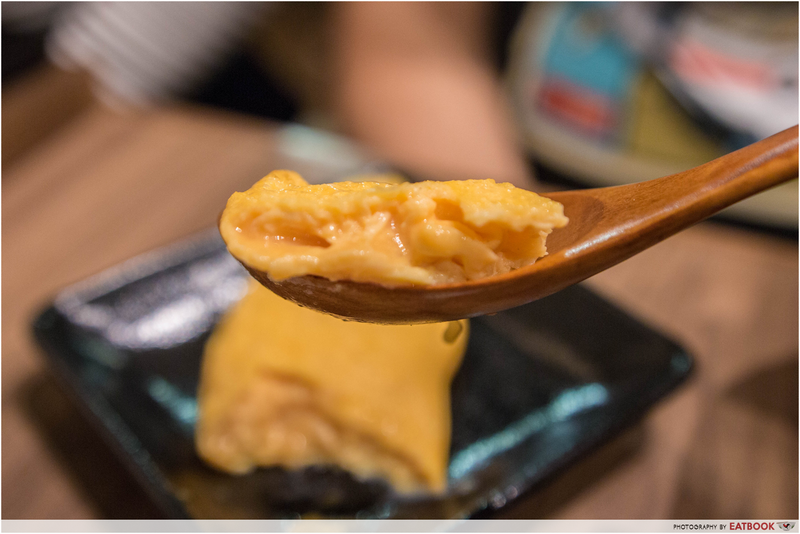 The must-try egg here is plain omelette, presented omu-style. Buttery, fluffy, and runny on the inside, this has forever spoiled the way I eat eggs. I now want a chef with a glittery hat to make beautifully-seasoned plain omelettes till the day I die. I’ve never been to Japan, but I’ve watched Jiro Dreams Of Sushi enough times to know that this places looks like a typical restaurant in Japan. Wooden fittings and furniture extend their metaphorical arms to welcome you into a wooden embrace. You also get to see and smell your hamburg patties prepared in front of your eyes. The kitchen is fairly open, so all you have to do is stand in front of the chefs and wait for the very eye-catching flambé. I’m sure the chefs won’t mind your prying eyes. Not at all. 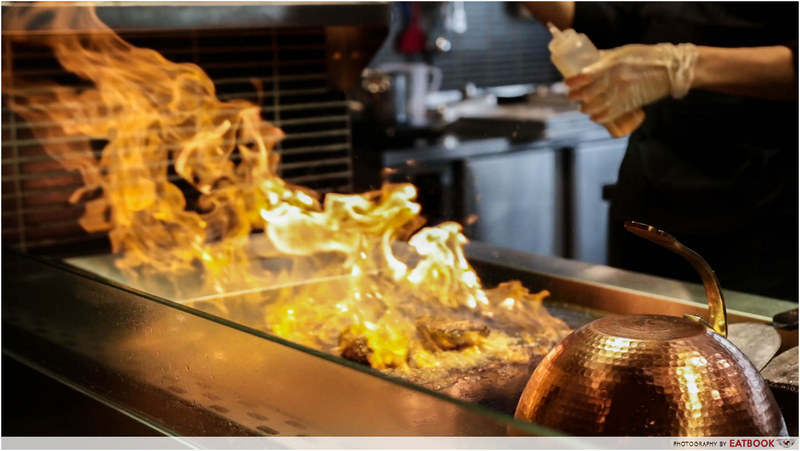 While you’ll smell the beef, you won’t smell beefy, thanks to their strong air-con and air circulation. Dining was a very pleasant experience, and we were kept cool while there. Pro-tip: opt to sit in a booth because there are free USB ports to charge your devices while dining! You just have to bring your own cable. Hamburg Streak Keisuke’s ridiculously tender beef patties are both its boon and bane. I’ve never tasted beef this delicate, in both structure and seasoning. But I also like my beef to feel like beef. That means with some chewiness, texture, and slightly bloody – elements all missing from Chef Keisuke’s hamburg. Thankfully, the salad bar and absolutely stellar eggs more than make up for any personal grievances. This was a media tasting at Teppanyaki Hamburg Nihonbashi Keisuke Bettei. When I grow up, I want to be Anthony Bourdain.